If you’ve been embedding XNA into your WinForms-based applications for games or editors, you probably built your solution off of the WinForms Series 1: Graphics Device code sample on MSDN. This solution implemented a GraphicsDeviceControl that could essentially embed the underlying DirectX buffer into a Panel, and a new GraphicsDeviceService implementation to manage one or more instances of your controls. A modified version of the WinForms Series demo using two SpinningTriangleControls. If you’ve tried porting your entire stack to MonoGame, you likely discovered that the several parts of the GraphicsDevice API entries that the WinForms Series implementation depended on are not implemented. The missing entries are specific overloads of the GraphicsDevice constructor, GrpahicsDevice.Present, and GraphicsDevice.Reset. At this time of writing, these entries are still not implemented. I’m not sure if it would be possible to port GraphicsDeviceControl to MonoGame’s SharpDX backend without them, but it turns out that we don’t need them if we use the OpenTK backend instead. Given that OpenTK will make your applications friendlier to port across to other systems, I’d say it’s the better choice anyway. Updated 7/28/2013 to reflect changes in public MonoGame API. Before we get started, you’ll need a copy of OpenTK’s GLControl library. MonoGame only ships with the base OpenTK library, so unless you want to build your own copy of OpenTK and GLControl from source to replace the MonoGame dependency, I suggest grabbing a copy of the GLControl source and directly embedding it in your project. It’s a tiny code base and MIT-licensed, so there should be no barriers to doing so. You can download a tarball of the latest GLControl source directly from their SVN repository here. I’ll assume you’re either starting with a stock set of files from the WinForms Series, or are working off of something very close in an existing project. Swap out all of your XNA references for MonoGame.Framework and OpenTK, add the GLControl code to your project, and we’ll move straight to the remaining code changes. Modify the class definition of GraphicsDeviceControl to extend from GLControl instead of Control. Change identifiers as necessary to match the rest of your class. The purpose of this block is to make the current control the “current” target for the shared OpenGL rendering context. Since OpenGL also has a different concept of the backbuffer dimensions than DirectX, we can simply update the PresentationParameters of the GraphicsDevice with the current control size, rather than relying on an implementation of GraphicsDevice.Reset to do it for us. This will display everything held in the back buffer, rather then relying on an implementation of GraphicsDevice.Present to do it. Most of the PresentationParameters are no longer relevent. This was the code in place at the original publication of the guide. The downloadable sample uses the newer revision. Delete all of the code within the ResetDevice method, making this call a no-op. You should be able to render multiple independent controls. If you’re working off the WinForms Series example, you may notice that the left control is rendering with a giant red X and threw an exception. That control depends on loading a SpriteFont from a content project which you may not have translated to MonoGame. Modifying your example to use two TriangleControls instead would demonstrate multiple controls in action. If you’re looking for techniques to embed an actual game into your new GraphicsDevice Control, check this next entry in the series. If you need to use MonoGame keyboard input with your control, there’s an entry for that too. An example repository can be found here. A complete sample project is available using the download link below. Another usage example can be found in the demo application of my MonoGame drawing library LilyPath. 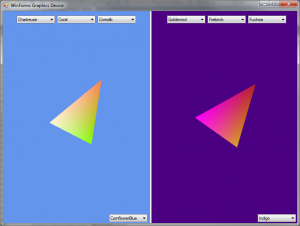 This entry was posted in Tutorials and tagged MonoGame, Tutorial, XNA. Bookmark the permalink. When I run my project, and use a SpriteBatch in my control, i get an argument is null exception. I dug further and the _d3dContext of the GraphicsDevice is null. Any ideas why? Anything D3D would indicate that you’re using a SharpDX back-end, which this guide is specifically not for. You may want to consider compiling MonoGame from source, so you can know for sure that it’s built from the MonoGame.Framework.WindowsGL project. I haven’t actually bothered with MonoGame’s installer at all, so if it’s shipping the SharpDX build by default for Windows, I should make a note about it in the guide. Yea, I used the monogame installer. Even though I chose the WindowsGL dll it was a windows 8…. After I got the code from the repository everything worked. Another question though, how would you handle MouseEvents in this control? I am using protected override void OnMouseDown(MouseEventArgs e). Should i be using the WindowsGL implementation? Basically just do whatever you did for your XNA-based controls. GLControl is just a plain old Control with a little bit of extra GL work going on underneath. In my current editor I attach to the control’s Mouse* events from an outside controller, but you can also override the OnMouse* methods. Hello jaquadro, I am trying to link the MonoGame.Framework.WindowsGL dll to this project by compiling the Source but I am getting error while creating the GraphicsDevice. As graphics adapter is throwing an exception. This is brilliant. I was just wondering today how hard it might be to create a GUI editor in WinForms with MonoGame. After some googling I found this and it works great! Thanks a bunch. If you’re doing generic GUI building you might be interested in taking a look at LilyPath for generic drawing or Treefrog for an editor example with object manipulation. Thanks very much for this extremely useful post. I’ve been trying to adapt it to my situation but am not having much luck. Essentially, I have a GameControl class that extends GraphicsDeviceControl and allows a Game instance to be passed in. A Timer then calls Tick() on the Game. To test, I created the simplest possible Game that just clears the background to a specific color. I then passed an instance of this to GameControl and hosted it in a Form. It worked. Next, I tried adding a 2D texture to my game. I then use a SpriteBatch to render that texture in the same position on every update. This works when running my game directly, but not when hosting inside Winforms via my GameControl. I’m a little confused as to why this would be. Do you have any idea what might causes this? If I understand correctly, you’re trying to get a Game() object to render into your GameControl? I remember trying to tackle this with XNA a long time ago, and my conclusion at the time was that it can’t be done with the stock Game object. Game contains its own window-derived Control that ultimately comes from a private instance of GamePlatform. OpenGL has this concept of a single active context that intercepts all of the GL API calls, like Clear. But it also has a concept of rendering contexts that also need to be applied to the actual control you’re drawing to. The line control.Context.MakeCurrent(WindowInfo); from the guide is the magic sauce that makes that work. To make this work for Game, you’re would need to get at a very deep underlying OpenTK.GameWindow object which is of course not part of the public API. Since MonoGame is open you’ve got a couple choices here. The first, which didn’t apply to XNA, its to modify your copy of MonoGame to expose an OpenTK.GameWindow, and use that in creating your form’s GraphicsDeviceService. But I’m really only speculating here because I haven’t tried it. The way I dealt with this in XNA was to avoid using the Game class altogether. I created my own GameControl that extended GraphicsDeviceControl and implemented the important parts of the Game API. Then I extended that with a new class that implemented my custom game logic, which would be akin to your Game1 class. How well this works depends on how you’ve architected your engine. I didn’t need instances of Game anywhere except as the main execution wrapper, so it was easy to replace. If you pass Game instances all over, then this approach would not work. Thanks for the prompt and helpful reply. I’m trying to apply what you’ve pointed me to, but am having trouble tracking down the Engine type you’ve used in your AmphibianGameControl class. Can you tell me what that is? Aha! Nevermind – I think I’ve figured it out. Engine was obviously specific to your game engine, right? I’ve just gotten a rudimentary proof of concept working. I now have my texture rendering inside a winforms app. I will need to clean it all up before using it for real, but now I at least know what I’m working towards. Thank you so much for your help – it was invaluable. I have a question, does your Input work? I can’t get any from mine. Thanks for pointing this out. I don’t think I ever tried. For my Windows.Forms-based usage, I’ve always used mouse events on the Windows control itself, or the Windows.Forms keyboard events/state. I went digging deeper and decided it was worth a separate post. I hope that provides an acceptable solution. I searched in the OpenTKGameWindow Code and saw how they managed to work with keyboard input. MonoGame Team has left me in a fun position. I updated the tutorial and downloads yesterday after being informed that the code didn’t work with latest MonoGame builds. In the latest builds, they’ve hidden the zero-argument GraphicsDevice constructor and added the XNA 3-argument constructor in its stead. I forgot that some of you might try building against older snapshots. I have updated the post to take this into account. Thanks for the note. Left one is one from GLControl and right one is from WindwsGL project, for both I used same code to draw them. Do you have any idea how can i fix this? All I get is a black screen when I use the code from the github. The game works perfectly in the non-embedded project but the Winform one just has the little buttons and a black screen where the game is supposed to be. Stay posted on the MonoGame website my friend, im making a DLL called MonoGame.Framework.Control and it will also be listed on Nuget it will support GL and DX(ITS ALREADY WORKING!) it just needs one small glitch fixed which im working on then I will be uploading it tonight or tomorrow. Additional information: Could not load file or assembly ‘System.Runtime.WindowsRuntime, Version=4.0.10.0, Culture=neutral, PublicKeyToken=b77a5c561934e089’ or one of its dependencies. The system cannot find the file specified. I’m not sure what’s wrong, I followed your tutorial here exactly, if you have any ideas to help that would be great. Thanks! I really don’t understand why does it not work? Please resolve me! and add to MyForm than run and it throws NullReferenceException – How do I fix? I already tried in GraphicsDeviceServices.cs GraphicsDevice as getter and setter. But it always throws. How do I fix?